Find errors easily, avoid wasted time and use Dynamics AX optimally. Health Check for Microsoft Dynamics AX is a complete system check that finds the source of errors and optimizes your system, master data, performance and security. Slow response times, frequent error messages or output that you cannot always trust. These are just some of the typical symptoms when your Microsoft Dynamics AX solution is no longer running optimally or when it could be used more appropriately. 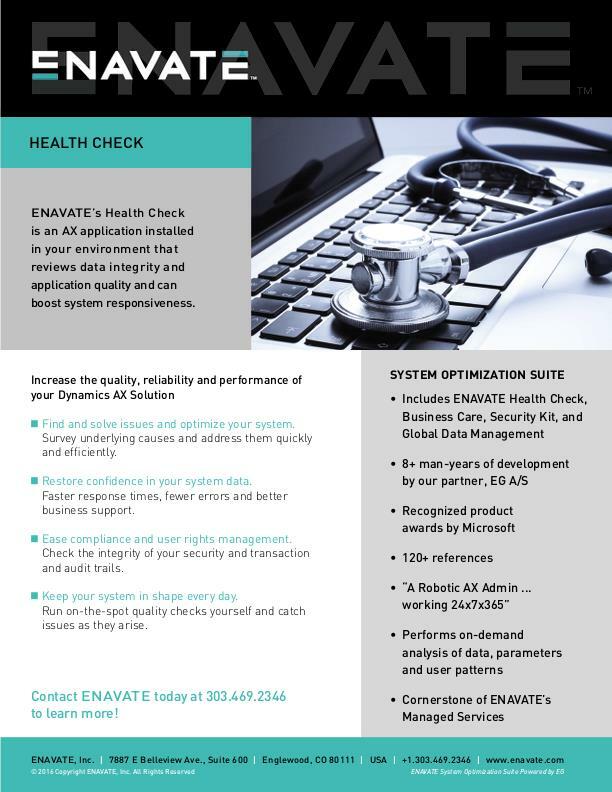 ENAVATE's Health Check maps the underlying causes and makes it easy to address them quickly and efficiently so that your Dynamics AX solution can run optimally again – whether the cause is master data that is not being handled correctly or a system set-up that no longer fully supports your business logic. Health Check is a software tool that ENAVATE installs on your Dynamics AX system. To start, ENAVATE runs a full report to identify specific underlying problems in your system. This report documents whether parameters are set correctly, if the system integrity is intact, or if the code, security and master data can be improved. If you deal with the discrepancies, you can improve the system significantly, reduce wasted time and enable your employees to work more efficiently. At the same time, you will experience better business support, minimized errors and increased confidence in your system. After the initial Health Check, you can easily carry out quality checks yourself, catch discrepancies as they arise and use Dynamics AX optimally. A special 'jump to error' function in Health Check makes it easy to conduct self-checks when, for example, registering master data. This continued daily focus on best practice helps to ensure the quality and integrity of the system. In other words, Health Check helps you to ensure that your company gets full value from its investment in one of the most business-critical parts of your IT infrastructure. Click here to learn more about our entire System Optimization Suite offering. ENAVATE is ready to optimize your AX solution! Ensure data integrity and application quality and boost system responsiveness. ENAVATE, a Microsoft Gold Partner, delivers business consulting and industry-focused enterprise software solutions based on Microsoft Dynamics 365 and Microsoft Dynamics AX, with a full range of services including implementation, migration, maintenance, support, and development for Microsoft Dynamics enterprise clients, ISVs and VARs worldwide.